Found this quirky retail site yesterday which caters to all lovers of Helvetica. We all know American Apparel's famous use of the typeface in simple and effective type-based design, not to mention the ten gazillion other wonderful and successful applications worldwide of this classic, beautiful, friendly and neat font. 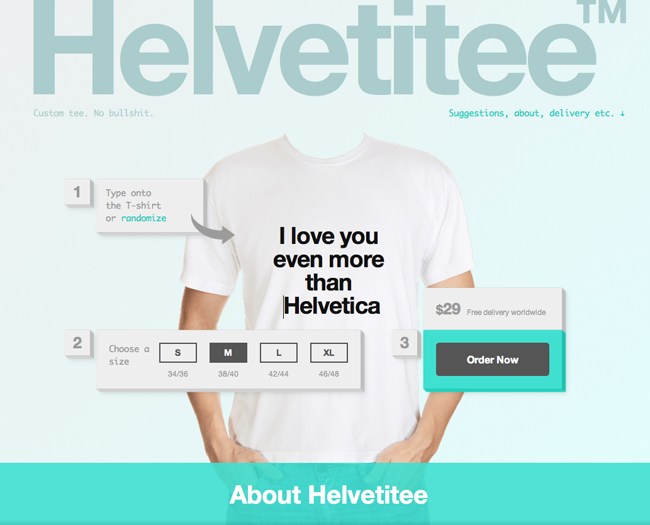 Now you can head to helvetitee.com to order your very own custom-printed tee featuring the copy of your choice. Shipping is free worldwide. Click through their 'randomize' options if you can't think of anything for yourself, some great ideas there as well. Love a smart, simple uncomplicated creative retail idea!